WOW, I cannot believe it is already time to run Rock the Parkway half marathon! I have been preparing for this race since January, with the hopes of running my little heart out. I never officially made a training schedule for this race, but I believe I kept myself on a pretty solid mental plan throughout. 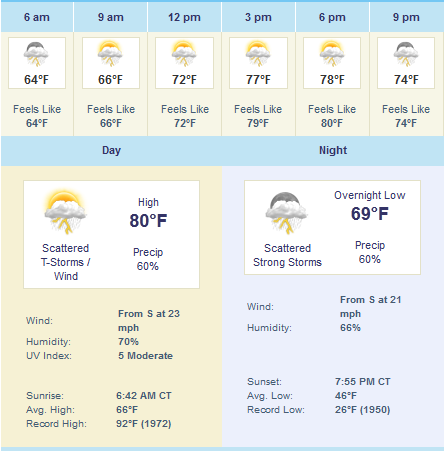 Take a look at the weather forecast for tomorrow (source: Weather.com). I have been running with asthma my entire life. I don’t know what it is like to run without it. Usually I can get by just fine, but every once in awhile I struggle. Right now, I seem to be struggling. I am not sure if it is the change in seasons, or the warm weather, but I am a wheezin’ machine. I actually heard myself wheezing this morning after walking up stairs. Which is totally awesome considering I have to run a half marathon tomorrow. Because of this current breathing situation, I will be forced to run with my inhaler tomorrow. The thought of having to give myself puffs of an inhaler while running 7 minute miles makes me cringe. But hey, I have done it before – and can do it again!! So here is what I need from you all…I need you to give me some encouragement. I also need to hear some inspiring stories of people running great races in hot weather while not being able to breathe. I am counting on you all…please don’t let me down! And by the way, TGIF!!!! I know you’re going to ROCK IT!!! Good luck Alicat!!! You will do great! Wish I could be there to cheer you on! Hey-you did the White Rock Full in 100% rain conditions. A half-marathon in the rain will be a walk in the park (if it rains, 60% is no guarantee). Best of luck, you’re gonna rock it! I’ll be several steps behind you cheering you on 🙂 want me to pack an Neb treatment just in case? Only kidding, you will do great Al. Just take it one mile at a time! You’ll do amazing!! I’ll set a goal for you and hope to wake up and hear that you did amazing. Just picture Christian Grey at the finish line 😉 And don’t move the duct tape. You’re a VIP run that way!!!! I have what they call Activity Induced Asthma. When it is humid and the air is think, my chest gets tight and thick (if you know what I mean). I have to make myself slow down my breathing. Calm myself. Take really deep breaths. In high school, I am sure you remember, they would not let me run with an inhaler. It stunk but I had to learn to control it. I am not nearly as bad as you are, especially now but I know how you feel. You know what you are doing and I know that you will be jsut fine. You are a great runner and will “Rock” this. 🙂 Good luck tomorrow and I will see you at our very own VIP potty!! Good luck Ali!! I can’t believe it is warmer in KS than in South Carolina?! What’s up with that?! I am going to freeze my buns off at a tri tomorrow morning! Wanna trade weather forecasts? Keep your head up no matter what happens and just keep asking yourself “How do I feel and what do I need right now?” That’s how I treat hot weather races! Kick a$$!